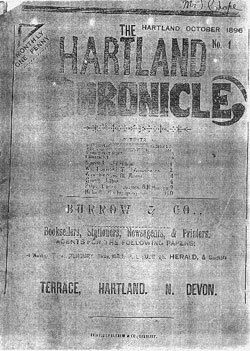 The Hartland Chronicle (from Feb 1906 entitled the Hartland and West Country Chronicle) was published from 1896 to 1940 by Thomas Cory Burrow, who lived in Hartland. Burrow's office was at the Terrace in Hartland town and the doorway with his name over it, can still be seen today. Pearse Chope contributed on a regular basis, mainly via his Notes of the Past, much of which formed the basis of his book Story of Hartland. 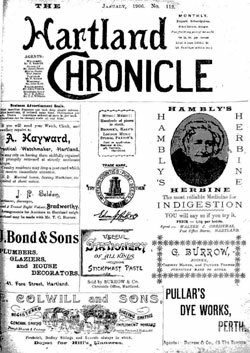 The first issue was produced on a hand made wooden printing press and published in October 1896 at a price of one penny. A total of 497 issues were printed from 1896 to 1940 at roughly monthly intervals until stopped by wartime paper shortages. This last was published on May 17th 1940, numbered 494-497 and at a cost of four pence. It has since been revived "in the footsteps of Thomas Cory Burrow" as the Hartland Times but as a bi-monthly publication. Notes of the Past (by regular contributor Pearse Chope) and news items from the following places:- Abbotsham, Alwington, Bradworthy, Bucks Mills, Clovelly, Hartland, Kilkhampton, Littleham, Lundy Island, Monkleigh, Morwenstow, Parkham, Welcombe, Woolsery, together with other regular features; Preachers Sunday Appointments (Methodist), Tides at Clovelly, Rainfall and Birth, Baptism, Marriage, Death and Burial column. In the listing of issues given below, the final few lines list the ten bound volumes located at Bideford Library and available for consultation there. The whole is also available on microfilm at Barnstaple Local Studies Library which extends the Bideford hard copy collection to include those missing issues from No 411 (April 1932) to No 497 (May 1940) - the British Newspaper library at Colindale also has virtually complete holdings.